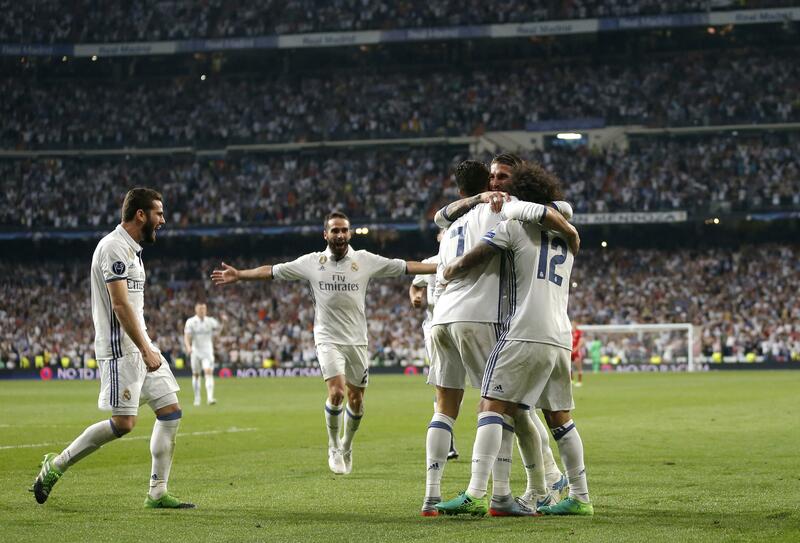 Wed., April 19, 2017, 9:01 a.m.
MADRID – Madrid clubs are making a habit of succeeding in European soccer. For the third time in four seasons, both Real Madrid and Atletico Madrid have made it to UEFA Champions League semifinals. Real Madrid reached the last four for the seventh straight time on Tuesday by eliminating Bayern Munich 6-3 on aggregate after a hat trick from Cristiano Ronaldo in a 4-2 win at the Santiago Bernabeu Stadium. Atletico Madrid advanced to the semis for the third time in four years by getting past Leicester 2-1 on aggregate following a 1-1 second-leg draw in England. Barcelona could be the other Spanish club to join the party if it overturns a 3-0 first-leg loss against Italian champion Juventus on Wednesday at the Camp Nou. Spanish clubs have won the European competition the last three seasons. Madrid and Atletico made it all the way to the final in 2014 and 2016, with Madrid coming out on top both times. The rivals also met in the quarterfinals in 2014-15, when Madrid again succeeded but was knocked out in the next round by Juventus. A draw on Friday will determine whether there will be another matchup between the Madrid clubs right away in the semifinals or if there will be another possibility for a derby in the final in Cardiff. The other semifinalist will be either Monaco or Borussia Dortmund, which will play in France on Wednesday. Monaco won the first leg 3-2. Madrid is going for a record 12th title in Europe’s top club competition. “It’s too early to think about that, but hopefully that’s what we will achieve in the end,” said Ronaldo, who on Tuesday became the first player to score 100 Champions League goals. He had scored twice in the first leg against Bayern in Munich. Atletico will be trying to win its first European Cup title and put an end to an uncomfortable streak of runner-up finishes. In addition to the recent losses to Madrid, it also finished second in the 1974 final against Bayern. Atletico lost the 2014 final after conceding an injury time equalizer that extended the match into extra time. Last year, it lost in a penalty shootout. Atletico has become a steady contender in European football since the arrival of Simeone five years ago, but the coach still dismisses the notion that the team is on the same level as the continent’s powerhouses. The 2014 Spanish champion, Atletico is third in this year’s Spanish league, 10 points behind leader Madrid, which is trying to win the competition for the first time since 2012. Published: April 19, 2017, 9:01 a.m.